When I was a kid, there was a progression you had to go through to learn how to ride a bike. You started on a tricycle, then moved up to a small bike with training wheels and finally, you learned to ride a regular bicycle. 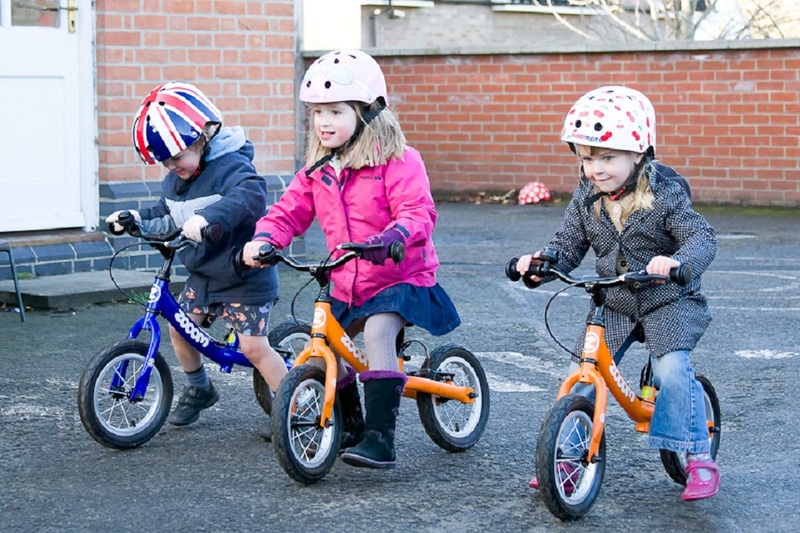 Today, kids can progress much easier and faster to ride a bicycle by starting them out young on a balance bike. Many people report that their child went from riding a balance bike to riding a pedal bike almost immediately, with no crashes. A balance bike is essentially a bike without pedals. Your child can push themselves along using their feet, or they can coast while standing on the footpegs. This simple design allows children to adjust to riding on two wheels at their own pace and comfort level. Now that we know what we’re looking for, let’s take a look at five of the best balance bikes available on the market, with a short review on each. 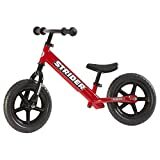 The 12 Sport balance bike from Strider is available in many colors and motorcycle brands, such as Honda and Harley-Davidson. The Strider Sport has a 12” frame and is recommended for children from 18 months to 5 years old. It weighs 6.7 pounds and can carry a rider up to 60 pounds. It includes a larger padded seat and post for larger kids. The frame is made from an aluminum alloy, the wheels are plastic and the tires are a lightweight but durable foam material. There are no tools needed for easy assembly, and none required to adjust the seat or handlebars. Customer reviews of the Strider Sport are very positive. Users love how light the bike is, and that the foam tires will never go flat. KaZAM Classic balance bike is available in every color imaginable, so you can get your child’s favorite. The KaZAM Classic bike has a 12” frame and is recommended for children 3-6 years old. It weighs 11.2 pounds and is rated for riders up to 75 pounds. Seat and handlebar height are adjustable. The frame and forks are made from steel, and the steel-spoked wheels have inflated rubber 12” tires. The limited assembly is quick and easy and requires no tools. Adjustments are tool-free as well. Kids simply love this balance bike. They really like that the size is bigger than a Strider, and that it is well-made. Some entry-level cyclist complained about flat tires, but KaZAM sent them everything they needed to fix the problem. The 12 Classic from Strider is similar to the Sport, but it only comes in blue, green, pink, and red. The Classic has a tube steel frame, with lightweight plastic wheels and foam rubber tires. Assembly is tool-free, just like seat and handlebar adjustments. People who bought this Classic balance bike love its simple, maintenance-free design. The only complaints were that the seat height was too short for older kids. Purchasing the padded seat with a longer seat post solved this problem. This balance bike from Schwinn comes in blue, green, red, and pink. This balance bike looks like a miniature version of an adult Schwinn Balance Bicycle. The frame here is 12”, and weighs 10.5 pounds. It is recommended for children 2 ½ to 5 years old. No weight limits are given. 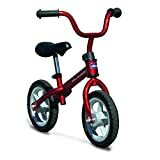 The Schwinn balance bike has a sturdy aluminum alloy frame with steel spoked wheels and rubber tires with inner tubes. Some assembly is required, as are wrenches to tighten up the wheels. Wrenches are not included with the bike. Since this balance bike is the most like a real bike, this isn’t a big surprise. Every cyclist loves this balance bike. They note the quality of construction, just like Schwinn puts into their larger bikes. The only complaint I found was that the lowest seat height was a little tall for smaller kids. This Chicco Red Bullet balance bike from Chicco only comes in red. This balance bike weighs 6 pounds and is recommended for children from 3-4 years old, up to 55 pounds. The frame here is tube steel with plastic wheels and foam rubber tires. Some assembly is required with the use of the included wrench to tighten the wheels and seat. This is the smallest Chicco Red Bullet balance bike out of this group, and that’s what cyclist love about it. Smaller children feel right at home on this bike. Negative comments noted that children outgrow this balance bike rather quickly. Always select a balance bike that comes in your child’s favourite color. They will be immediately drawn to it and are much more likely to ride it. Figure out what kind of tires you are looking for on the balance bike. There are several different types available. Factor in the overall weight of the balance bike. Smaller children need a lighter bike so they can pick it up. Other important considerations are size, recommended ages, frame material, ease of assembly, price. I will discuss these considerations more in-depth after the balance bike reviews. So how do you choose which is the best balance bike for your toddler? There are several areas to consider. Make sure the balance bike you buy is the correct size for your toddler. Look at the manufacturer’s age recommendations, and also consider the weight of the bike. Measure your child’s inseam and browse user reviews to determine the seat height at the lowest setting. In short, make sure it will fit your child. Just like any other bike, the heart and soul of a balance bike is the frame. Make sure the bike you select has a light, but durable metal Bicycle frame. Also, take a close look at the wheels. The best wheels have inflated rubber tires, not some cheap plastic which is rough to ride on and will break over time. Make sure you select a balance bike that is easy to put together. This is an area where browsing through expert reviews can be especially helpful. Ascertain if the instructions are clear, any necessary tools are included, and the total time to put the bike together. Modern technology allows us to quickly gauge the opinions of others who have purchased and used a product. Look through 5-10 reviews on a product before you buy. I usually read two top reviews, two middle reviews, and two negative ones. This is a great way to gather a consensus. A price is a useful tool when it comes to narrowing down our choices. I recommend setting a price that you are willing to spend on any purchase before you start shopping. Stick to it. This helps you quickly eliminate products out of your price range. Even though I believe that all five of these balance bikes are great choices, I always like to select a winner. Out of these expert reviews of the best balance bikes for toddlers, the winner is the Schwinn Balance Bike, 12-Inch. I love that it is made with the same high-quality materials that Schwinn puts into its big bikes. I also love the frame design, which allows a low seat-height adjustment and has integrated foot pads. The handlebar pad is there for safety, and it comes in four cool colors. When you add in a great warranty and a real seat, the Schwinn Balance Bike is the best value for your money.